This is a book that I wish that I didn't have to give up as part of an ARC tour. I would have loved (and benefitted from) reading it again to really soak in all the details. Take your time with this book- there is so much, even from the very beginning. There are small details that you don't want to miss, because they come into play later in the story. Incarnate started out slow. The author takes her time, only introducing the reader to small amounts of the "world" at a time. We don't get explained everything right away (and you will still have many unanswered questions at the end of the story). The author has weaved a very intricate and complex tale that will undoubtedly take more than a sequel to explain - unless that sequel is 900 pages! I will admit- I was a little frustrated to start out with. Enjoy how slowly it moves at the beginning. A little over halfway throughout the book there is a masquerade. Please pay attention: read this twelve times! Holy cow! The passion. The romance. It is a very steamy scene! And after the masquerade- the author becomes relentless. The story moves at a breakneck pace and has no mercy for the reader. You will finish the story and have to read it over again just to begin to comprehend everything that happened in the second half of the story. I enjoyed Incarnate, and I really feel that it lives up to the high expectations that the cover creates. 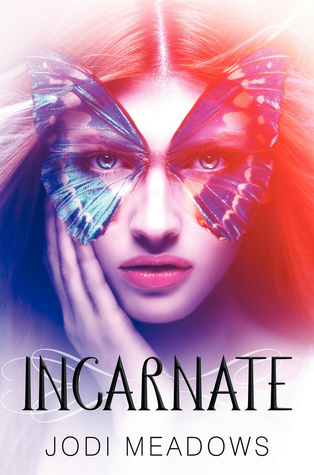 If you are a fan on fantasy, sci-fi, or dystopian- you will enjoy Incarnate. Thank you to Around the World ARC Tours for this book. @_@ yeah i'm diffently going to read it after you said this "A little over halfway throughout the book there is a masquerade. Please pay attention: read this twelve times! Holy cow! The passion. The romance. It is a very steamy scene!" Thanks for the great review!